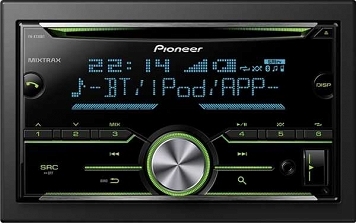 PIONEER FH-X730BT (FHX 730 BT) CD 2-DIN new generation of Bluetooth, USB and Spotify. Device Support Apple iOS and Android. Attractive design 2-DIN player FH-X730BT leaves plenty of space for a large display with dot-matrix, as well as for volume control and a set of six preselection buttons, which allow instant selection of your favorite radio stations and much more. The player FH-X730BT is fully compatible with Spotify, both in the free version, as well as Premium. Simply connect the device running Apple iOS or Android, to be able to freely enjoy your favorite playlists, albums, songs and artists using buttons player FH-X730BT. Bluetooth connectivity allows for safe and convenient phone calls, and wirelessly stream music directly from your phone. With its unique technology, Advanced Sound Retriever Pioneer sound quality will be as close as possible to the original recording. You can even connect two phones at the same time. There is no doubt - FH-X730BT is a real car audio system, high-end, supports playback of FLAC files, and equipped with a 13-band graphic equalizer and a built-in 4x50 Watt amplifier transistor. Thanks to the Time Alignment will be able to enjoy the best sound quality, regardless of what the car will be player installed.